Great news! An in-depth article about endangered languages is in this month’s issue of National Geographic Magazine. Written by journalist Russ Rymer, with amazing images by photographer Lynn Johnson, the article explores global language loss, with profiles on language revitalization efforts among speakers of languages such as Tuvan, Aka, Chemehuevi, Wintu, Euchee and Seri. Living Tongues Director Dr. Gregory D.S. Anderson and Director of Research Dr. K. David Harrison were interviewed for the piece, and their documentation work in Arunachal Pradesh (India), among Aka speakers, is discussed. Pick up a copy in news stands before the end of the month! 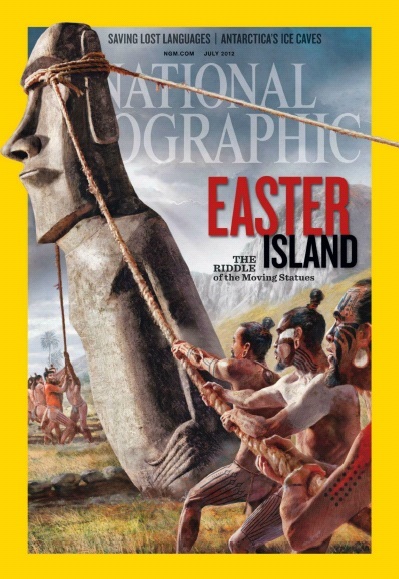 Here is the cover, which features coverage on Easter Island, and in the top left-hand area, you can see that “Saving Lost Languages” is one of the featured topics of the issue. This entry was posted in Endangered Language Activism, Enduring Voices Project, Gregory D. S. Anderson, Indigenous Language Activists, K. David Harrison, Language Hotspots, Launches and Public Events, Media and Publicity, Support Endangered Languages and tagged Bolivia, Dr. Gregory D. S. Anderson, Dr. K. David Harrison, endangered languages, enduring voices, feature, fieldwork, global linguistic diversity, India, july 2012, living tongues, magazine, media, nat geo, national geographic, siberia, The Linguists, Tuva, vanishing voices by livingtongues. Bookmark the permalink.